Our “Interview-to-Placement Ratio” is “Half the Industry Average,” which saves our Clients time and money! Our proven methodology allows us to assess a Candidate’s skills and career goals in order to handpick only the very best talent for our Clients. We also meet with our Clients face-to-face, which allows them to get to know us. This is an important step to gain a clear understanding of what they want and expect. Our unique process helps to ensure that we only send our Clients the Candidates who can fit their team. This allows our Clients to spend less time reviewing unqualified résumés and more time interviewing Candidates they will be eager to hire. Please contact us at info@pshouston.com or 713-462-6414 to arrange a face-to-face meeting on how we can provide the best solutions for your organization, and begin developing a long-term relationship with you! The current economy has forced many Companies to face budget decisions that result in staff reduction(s). This can be one of the most challenging tasks a Company will encounter. Platinum Solutions offers services and resources to support both Management and Staff whether you are downsizing 1 or 1,000 employees. These services are designed to assist a Candidate during a very challenging time in their life. 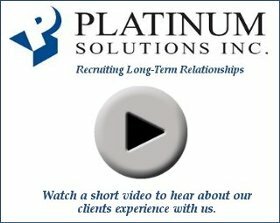 Platinum Solutions can provide the Job Search tools needed to get them back to work sooner than they could on their own. Not only do employees appreciate the fact that you care enough to assist them in a tough time but these services can in many cases pay for themselves in the reduced unemployment expenses your Company would otherwise have to pay. Tired of all the administrative headaches and hassles associated with your payroll? Platinum Solutions offers an effective and affordable solution that will allow you to focus on what is most important, your business! While there is an upfront investment for a retained search, this type of search has proven to produce the best results. With this search, there is rarely any expense to you (our Client) until a Candidate accepts your offer of employment. This service not only allows our Clients to optimize their day-to-day activities and cope with any staffing fluctuations, but can also save them money on payroll, benefits and unemployment expenses. Whether it’s for a short-term assignment, long-term project or a strategic business objective, Platinum Solutions is your trusted partner. Our proven recruitment, assessment and selection process means we will not only find you the number of Candidates you need quickly, but we will also find you the right Candidate(s). You will have the flexibility to staff up or down quickly. This is an attractive method for many of our Clients to find the right Candidate before making a long-term commitment. The Candidate is brought in-house as a consultant who is actually employed by Platinum Solutions but works for you, with the understanding that a direct-hire position may become available in the future. If our Clients do not yet have the signatures or approvals needed to bring on an additional employee, this is a popular method used until the paperwork is completed. It allows our Clients to receive the benefits of ongoing productivity while evaluating the Candidate's long-term potential with your team. With this service the Candidate actually becomes a direct-hire employee of our Client. We realize that hiring the RIGHT PERSON for your Company is critical! Platinum Solutions offers immediate access to one of the largest inventories of pre-screened Candidates in the industry! We have a proven track record of placing exceptional Candidates in a variety of markets and at all levels of experience. "During my career I have had a working relationship with dozens of recruitment companies. I consider Platinum Solutions to be the top performer and is my first choice when I have personnel needs." "In all my years as a manager I can honestly say that the people we interview from Platinum Solutions really do stand out when compared to the competition. They obviously know what they are doing." "I appreciate the fact that Platinum Solutions does not waste my time and obviously the great results speak far louder than mere words." "We have dealt with over 15 recruiting firms in the last 12 months and Platinum Solutions ranks as number one because they provide qualified candidates that meet our rigorous screening process." "The candidates that Platinum Solutions has placed with us are some of the finest employees in our company. We couldn't be more satisfied." "Platinum Solutions really knows the market and has played a key role in our company's recruitment efforts." "Platinum Solutions has provided the best candidates of any agency we have ever used. I had no doubt they would since in my previous position their recruiters filled just about every position I presented them." "Platinum Solutions took the time to learn and understand our needs and did an excellent job of screening candidates and presenting only those that meet our requirements. Within a short time, we were able to fill our position."